A super-convenient location just off Route 6 Cape Cod's main artery a pet-friendly policy and amenities such as free Wi-Fi draw guests to the Ocean Park Inn. The inn's 54 simple rooms on two levels are all non-smoking and include free Wi-Fi mini-fridges coffeemakers cable TVs and air-conditioning. Rooms are accessed from exterior corridors. 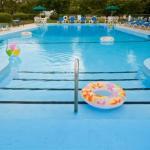 An outdoor pool and picnic area with barbeque grills is also available. Inn guests also have access to amenities at the adjacent Four Points by Sheraton including indoor and outdoor pools a game room tennis court fitness center business center and restaurant that serves breakfast lunch and dinner. Pets are welcome for a fee. Parking is free. The Salt Pond Visitor Center for the Cape Cod National Seashore is a mile from the inn. For a blast from the past the Wellfleet Drive-In Theatre two miles away is open from late April through mid-September. The Wellfleet Bay Wildlife Sanctuary is five miles away and the whale watches of Provincetown at the very tip of the Cape are 20 miles away. Boston's Logan International Airport in is 96 miles away.